Please Select Monthly to donate automatically every month, or One Time Only to proceed as usual. If you would like to opt-out from our mailing list, please note that in the comment box above. Americans for Peace Now is a not-for-profit, 501(c)(3) organization. 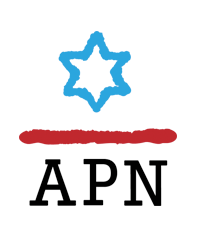 Contributions to APN are tax-deductible. If you have any questions or need to stop or update a credit card, please contact our Controller Rob McCulloch at 617-686-2265 or rmcculloch@peacenow.org. If you prefer to mail a check, make it payable to: Americans for Peace Now, Inc.